See my Ravelry page for details. These were made for Nadia. 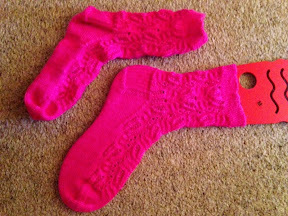 I made them a bit smaller than usual... but too small so had to order and quickly make a larger pair before she went on her holiday to China when it was really cold and she was excited to have hot pink socks.